Anastrover is a potent and selective non-steroidal aromatase inhibitor indicated for the treatment of advanced breast cancer in post-menopausal women with disease progression following tamoxifen therapy. Many breast cancers have estrogen receptors and growth of these tumors can be stimulated by estrogens. In post-menopausal women, the principal source of circulating estrogen (primarily estradiol) is conversion of adrenally-generated androstenedione to estrone by aromatase in peripheral tissues, such as adipose tissue, with further conversion of estrone to estradiol. Many breast cancers also contain aromatase, the importance of tumor-generated estrogens is uncertain. Treatment of breast cancer has included efforts to decrease estrogen levels by ovariectomy premenopausally and by use of anti-estrogens and progestational agents both pre- and post-menopausally, and these interventions lead to decreased tumor mass or delayed progression of tumor growth in some women. Anastrover is a potent and selective non-steroidal aromatase inhibitor. It significantly lowers serum estradiol concentrations and has no detectable effect on formation of adrenal corticosteroids or aldosterone. Anastrover is the first in a new class of third-generation selective oral aromatase inhibitors. It acts by blocking the enzyme aromatase, subsequently blocking the production of estrogen. Since many forms of breast cancer cells are stimulated by estrogen, it is hoped that by reducing amounts of estrogen in the body the progression of such a disease can be halted. This is the basic premise behind Nolvadex, except this drug blocks the action and not production of estrogen. The effects of Anastrover can be quite dramatic to say the least. A daily dose of one tablet can produce estrogen suppression greater than 80 % in treated patients. With the powerful effect this drug has on hormone levels, it is only to be used (clinically) by post-menopausal women whose disease has progressed following treatment with Nolvadex (tamoxifen citrate). Side effects like hot flushes and hair thinning can be present, and would no doubt be much more. 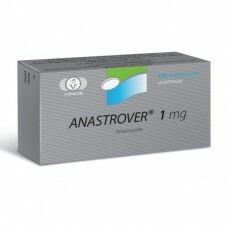 For the steroid using male athlete, Anastrover shows great potential. Up to this point, drugs like Nolvadex and Proviron have been our weapons against excess estrogen. These drugs, especially in combination, do prove quite effective. But Anastrover appears able to do the job much more efficiently, and with less hassle. A single tablet daily, the same dose use clinically, seems to be all one needs for an exceptional effect (some even report excellent results with only 0.25 mg daily). When used with strong, readily aromatizing androgens such as Dianabol or testosterone, gynecomastia and water retention can be effectively blocked. In combination with Propecia (finasteride), we have a great advance. With the one drug halting estrogen conversion and the other blocking 5-alpha reduction , related side effects can be effectively minimized. Here the strong androgen testosterone could theoretically provide incredible muscular growth, while at the same time being as tolerable as nandrolone. Additionally the quality of the muscle should be greater, the athlete appearing harder and much more defined without holding excess water.